Click letters to make words and solve thousands of familiar phrases in this exciting sequel to ´Flip Words´ -- one of most addictive words games around. 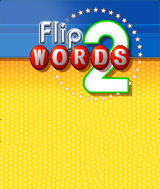 ´Flip Words 2´ builds on the fun and challenging gameplay of the original by adding exciting new game modes, visual themes, and a wider variety of phrase categories. Test your word making skills in Classic mode and, for an intriguing change of pace, try the new Strategy mode where you earn and spend tokens to help you solve the phrase.